The United Nations’ cultural body cancels Jewish exhibit, citing "concerns for Israel-PA peace talks." The exhibition, entitled "People, Book, Land - The 3,500 Year Relationship of the Jewish People and the Land of Israel", was co-organized by UNESCO, the UN body for education, science and culture, and the Simon Wiesenthal Center. The exhibit was scheduled to open next Tuesday at the UNESCO headquarters in Paris. It was pulled after a group of Arab states, as well as the Palestinian Authority (PA), said they found it "deeply disturbing," reported The Jewish Chronicle. 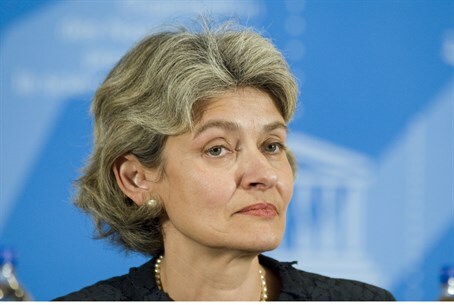 "Sadly, Bokova's decision to sacrifice education, science and culture to backroom political pressure is routine at UNESCO when it comes to Israel," added Neuer. "Since 2009, UN Watch has counted no less than 46 UNESCO resolutions against Israel, one on Syria, and zero on Iran, North Korea, Sudan or any other country in the world,” he noted. "This malicious treatment is especially tragic because UNESCO was founded after World War II with the express purpose of combating the doctrine of the inequality of men and races, Today it as sadly become a serial perpetrator of inequality," concluded Neuer. After admitting “Palestine” as a member, UNESCO designated Bethlehem's Church of the Nativity and the nearby pilgrimage route as a World Heritage site. Most recently, a UNESCO “monitoring visit” to the Old City of Jerusalem was called off by Israel after it was discovered that the PA was were trying to "politicize" it contrary to understandings reached by the sides, and to change the action plan UNESCO decided upon in 2010.